(CNN) -- Two Californians, one of whom died, may have been exposed to mice droppings or urine that contained hantavirus while vacationing at Yosemite National Park, health officials said Thursday. The visitors contracted hantavirus cardiopulmonary syndrome, a rare but often fatal lung disease. The two had stayed at the popular Curry Village in mid-June, according to the California Department of Public Health. An unidentified 37-year-old man from the San Francisco Bay area died in late July, said Dr. Vicki Kramer, chief of the department's vector-borne disease section. A Southern California woman in her 40s survived and is recovering, Kramer told CNN. The two stayed in separate locations at the village, which contains about 400 canvas tent and wooden cabins. "They are very sparse but comfortable," Yosemite ranger and spokesman Scott Gediman said of the tent cabins where the man and woman stayed. Officials have focused on deer mice, common in the high-elevation eastern Sierra Nevada region. The mice are gray or brown on top, with white bellies. Their ears have no fur. "Rodents can infest a whole range of these structures," Kramer said. "Deer mice can get in a hole one-quarter inch in diameter." In the United States, the carriers of hantavirus are deer mice, cotton rats, rice rats and white-footed mice, according to the U.S. Centers for Disease Control and Prevention. The virus can be present in the rodents' urine, droppings and saliva, and is spread to people when they breathe in air contaminated with the virus, the CDC says. The virus is not communicable from person to person. Rodent control is the primary strategy for preventing the hantavirus syndrome, according to the CDC. California's health department has worked with Yosemite National Park for years to reduce the risks to visitors, Kramer said. The agency and park public health officers routinely conduct rodent surveillance, and the park inspects buildings and facilities, it said. The battle begins with workers routinely disinfecting floors and removing mouse droppings. Once park officials learned of the two cases, all 400 camp structures were thoroughly cleaned, Gediman said Thursday. Yosemite National Park has increased routine measures to reduce the hantavirus risk, according to officials. "You cannot eliminate all the mice," Kramer said. "There are a lot of people and snacks that people bring into their tents or cabins." 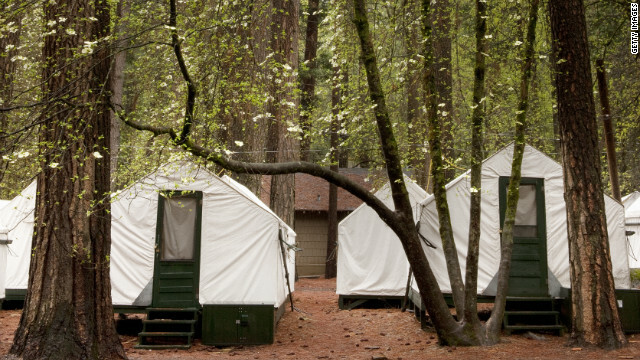 Gediman said officials consider Curry Village safe and guests have not canceled lodging reservations in the busiest month of the year at Yosemite. Officials urge people to clean areas of rodent infestation with caution. It's best not to vacuum or sweep, because that can push hantavirus particles into the air, where they can enter the lungs. Rather, people should wear gloves and use bleach where they see mouse droppings. They should let the bleach sit for 15 minutes before using a mop or sponge to clean up. Opening shuttered areas to air and sunlight also is suggested. The two recent hantavirus cases bring the 2012 total in California to four. About one-third of the 60 cases reported in the state since 1993 have been fatal, the department said. Yosemite National Park saw one hantavirus case each in 2000 and 2010. There is no specific treatment for hantavirus infection, according to the CDC, but the earlier the patient is brought to intensive care, the better. Diagnosis is difficult, because early symptoms of fever, muscle aches and fatigue often are confused with the flu. "However, if the individual is experiencing fever and fatigue, and has a history of potential rural rodent exposure, together with shortness of breath, (that) would be strongly suggestive of HPS," the CDC says. Pest may cause the spread of different viruses and bacteria. This could be harmful to you and the people in your home.